Whether you are a Parent, Grandparent or Carer all are welcome to bring their children to our Tiny Tots group. 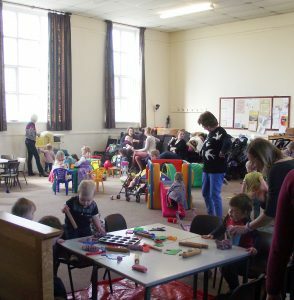 There are many activity-toys and games for the children to play with and each week you will also find a craft activity to join in with too; plus a story from the Bible and songs. Tea, coffee and biscuits are available for the adults, juice and biscuits for the tots. There is always a warm and friendly atmosphere giving the adults time to chat while watching their charges in a safe environment, and we are always glad to see new faces. Our information and registration leaflet is available for download here.